Audio recorder with quick-capture workflow in mind. Is there a better alternative to TapeDeck? Is TapeDeck really the best app in Audio category? Will TapeDeck work good on macOS 10.13.4? 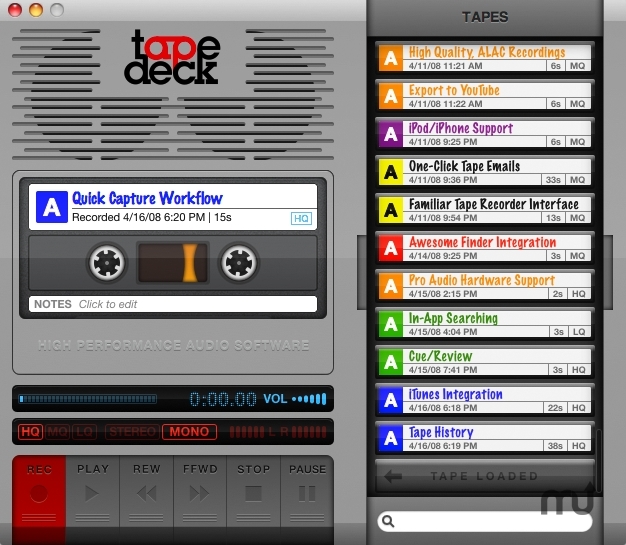 TapeDeck is a new audio recorder exclusively for OS X, designed with a quick-capture workflow in mind. You're never more than a single mouse click (or keystroke) away from making a new recording, which are called, unsurprisingly, "tapes." TapeDeck records directly to compressed MP4-AAC audio, making it equally useful for quick high-fidelity samples or hours and hours of lecture. Fixes bugs that lead to a failure to launch on OS X 10.9 Mavericks. TapeDeck needs a rating. Be the first to rate this app and get the discussion started! Every recording you ever make is immediately saved in the box of Tapes. You cannot record over an existing tape; clicking Record automatically starts a new tape for you. In much the same way that digital cameras made film "free," TapeDeck makes tapes "free": you'll never run out of tape (until you run out of disk space). TapeDeck's recording quality is far better than that of an audiocassette. You can adjust the recording quality to trade file size for recording length. An audiocassette has a label (where you can write a little bit) and a case liner (where you can write a lot). TapeDeck has these too, but they're full-text searchable. Tapes are standard .m4a audio files, so you can copy them into iTunes and synchronize them with your iPod, or email tapes to others. To record with TapeDeck, you must have a built-in microphone, use device plugged into your Mac's line-in port (such as a microphone, record player, etc. ), or another audio input device (USB input, Bluetooth headset, etc. ).